The science of nanotechnology could lead to radical improvements for space exploration. When it comes to taking the next "giant leap" in space exploration, NASA is thinking small - really small. In laboratories around the country, NASA is supporting the burgeoning science of nanotechnology. The basic idea is to learn to deal with matter at the atomic scale - to be able to control individual atoms and molecules well enough to design molecule-size machines, advanced electronics and "smart" materials. If visionaries are right, nanotechnology could lead to robots you can hold on your fingertip, self-healing spacesuits, space elevators and other fantastic devices. Some of these things may take 20+ years to fully develop; others are taking shape in the laboratory today. Thinking small Simply making things smaller has its advantages. Imagine, for example, if the Mars rovers Spirit and Opportunity could have been made as small as a beetle, and could scurry over rocks and gravel as a beetle can, sampling minerals and searching for clues to the history of water on Mars. Hundreds or thousands of these diminutive robots could have been sent in the same capsules that carried the two desk-size rovers, enabling scientists to explore much more of the planet's surface - and increasing the odds of stumbling across a fossilized Martian bacterium! But nanotechnology is about more than just shrinking things. When scientists can deliberately order and structure matter at the molecular level, amazing new properties sometimes emerge. An excellent example is that darling of the nanotechnology world, the carbon nanotube. Carbon occurs naturally as graphite - the soft, black material often used in pencil leads - and as diamond. The only difference between the two is the arrangement of the carbon atoms. When scientists arrange the same carbon atoms into a "chicken wire" pattern and roll them up into miniscule tubes only 10 atoms across, the resulting "nanotubes" acquire some rather extraordinary traits. Nanotubes: �	Have 100 times the tensile strength of steel, but only 1/6th the weight. �	Are 40 times stronger than graphite fibers. �	Can conduct electricity better than copper. �	Can be either conductors or semiconductors (like computer chips), depending on the arrangement of atoms. �	And are excellent conductors of heat. Much of current nanotechnology research worldwide focuses on these nanotubes. Scientists have proposed using them for a wide range of applications: 1. In the high-strength, low-weight cable needed for a space elevator. 2. As molecular wires for nano-scale electronics; embedded in microprocessors to help siphon off heat. 3. And as tiny rods and gears in nano-scale machines, just to name a few. Nanotubes figure prominently in research being done at the NASA Ames Center for Nanotechnology (CNT). The center was established in 1997 and now employs about 50 full-time researchers. "We try to focus on technologies that could yield useable products within a few years to a decade," says CNT director Meyya Meyyappan. "For example, we're looking at how nano-materials could be used for advanced life support, DNA sequencers, ultra-powerful computers, and tiny sensors for chemicals or even sensors for cancer." A chemical sensor they developed using nanotubes is scheduled to fly a demonstration mission into space aboard a Navy rocket next year. This tiny sensor can detect as little as a few parts per billion of specific chemicals - like toxic gases - making it useful for both space exploration and homeland defense. CNT has also developed a way to use nanotubes to cool the microprocessors in personal computers, a major challenge as CPUs get more and more powerful. This cooling technology has been licensed to a Santa Clara, California, start-up called Nanoconduction, and Intel has even expressed interest, Meyyappan says. Designing the future If these near-term uses of nanotechnology seem impressive, the long-term possibilities are truly mind-boggling. The NASA Institute for Advanced Concepts (NIAC), an independent, NASA-funded organization located in Atlanta, Georgia, was created to promote forward-looking research on radical space technologies that will take 10 to 40 years to come to fruition. For example, one recent NIAC grant funded a feasibility study of nanoscale manufacturing - in other words, using vast numbers of microscopic molecular machines to produce any desired object by assembling it atom by atom! In his 112 page report, Phoenix explains that such a "nanofactory" could produce, say, spacecraft parts with atomic precision, meaning that every atom within the object is placed exactly where it belongs. The resulting part would be extremely strong, and its shape could be within a single atom's width of the ideal design. Ultra-smooth surfaces would need no polishing or lubrication, and would suffer virtually no "wear and tear" over time. Such high precision and reliability of spacecraft parts are paramount when the lives of astronauts are at stake. Although Phoenix sketched out some design ideas for a desktop nanofactory in his report, he acknowledges that - short of a big-budget "Nanhatten Project," as he calls it - a working nanofactory is at least a decade away, and possibly much longer. Taking a cue from biology, Constantinos Mavroidis, director of the Computational Bionanorobotics Laboratory at Northeastern University in Boston, is exploring an alternative approach to nanotechnology: Rather than starting from scratch, the concepts in Mavroidis's NIAC-funded study employ pre-existing, functional molecular "machines" that can be found in all living cells: DNA molecules, proteins, enzymes, etc. Shaped by evolution over millions of years, these biological molecules are already very adept at manipulating matter at the molecular scale - which is why a plant can combine air, water, and dirt and produce a juicy red strawberry, and a person's body can convert last night's potato dinner into today's new red blood cells. The rearranging of atoms that makes these feats possible is performed by hundreds of specialized enzymes and proteins, and DNA stores the code for making them. 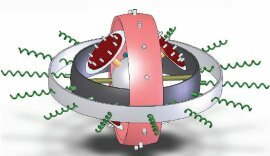 Making use of these "pre-made" molecular machines - or using them as starting points for new designs - is a popular approach to nanotechnology called "bio-nanotech." "Why reinvent the wheel?" Mavroidis says. "Nature has given us all this great, highly refined nanotechnology inside of living things, so why not use it - and try to learn something from it?" The specific uses of bio-nanotech that Mavroidis proposes in his study are very futuristic. One idea involves draping a kind of "spider's web" of hair-thin tubes packed with bio-nanotech sensors across dozens of miles of terrain, as a way to map the environment of some alien planet in great detail. Another concept he proposes is a "second skin" for astronauts to wear under their spacesuits that would use bio-nanotech to sense and respond to radiation penetrating the suit, and to quickly seal over any cuts or punctures. Futuristic? Certainly. Possible? Maybe. Mavroidis admits that such technologies are probably decades away, and that technology so far in the future will probably be very different from what we imagine now. Still, he says he believes it's important to start thinking now about what nanotechnology might make possible many years down the road. A sprawling web of nanosensors maps the terrain of an alien planet. The cross-section at the top-right shows biologically derived molecules (yellow and red) that would perform the sensing and signaling functions. Considering that life itself is, in a sense, the ultimate example of nanotechnology, the possibilities are exciting indeed.